A British Columbia junior went from 18 cents over the course of seven trading days ago to a close of $1.05 on Friday after a spate of announcements following up on Colorado Resources' North Rok property drill results released in late April. The property, 190 kms north of Stewart B.C and near the news Red Chris mine development, is a porphyry copper-gold project. On April 25 the company (CVE:CXO) said its first drill of 242 m showed 0.63 % copper and 0.85 g/t gold. The nearby Red Chris Mine has proven and probable reserves of 301.5 million tonnes grading 0.359 % copper and 0.274 g/t gold. The company president and CEO Adam Travis said the geophysical data showed ". . . very robust Copper/Gold system." "We clearly need to conduct more IP geophysics to the south and at depth and continue drilling." After the drill results announcement, the company released a model of geophysical data and said it secured a mobilized rig for step out drilling. The company says an exploration program will begin as early as conditions allow in 2013. On its website, the company says it will use the its ". . . strong cash position to take advantage of opportunities presented by the current slow market conditions." As of Sept. 30, 2012 the company said it had Can$9.3 million in working capital. Shares outstanding are 39.06 million and the market capitalization is Can$41.01 million. 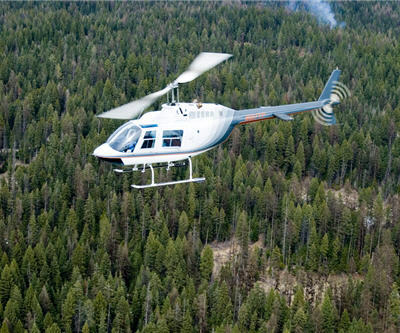 Image of a helicopter by [email protected]!